Pain is one of the most important symptoms of Rheumatoid Arthritis and many other conditions. Pain is the most obviously significant signal that something is wrong. However, pain is also the most difficult symptom to measure. Since pain is such an important indicator that something is “wrong,” we ought to find better ways to measure pain and more meaningful ways to relate pain to disease activity. Obviously, pain is mostly invisible. I say mostly because pain can be seen on the face with a furrowed brow or winced eyes, especially in people who strive to be quiet about their pain. Helping people to quantify their pain in a way that is as objective as possible so that it’s meaningful to care-givers (personal and professional). Having a trusted scale that allows care-givers to take patients at their word. Looking over the inadequate pain scale examples from the NIH Pain Consortium is discouraging; something better is obviously needed. For healthcare professionals, the ultimate challenge is to determine the meaningfulness of pain. The pain scale is only a means to this understanding. A good doctor or nurse needs to know how a patient’s pain is associated with disease activity. The pain scale can only help the provider to discern disease activity as he appreciates what a patient’s pain is like and deduces what the origin of it may be. “Pain follows the same pattern of development as other parameters of disease activity in groups of patients with RA,” Assessment of Pain in Rheumatic Diseases. The provider has another difficulty that has nothing to do with a particular patient or pain scale used: His own experience or lack of experience with pain is the only means that he has to relate to pain. His ability to comprehend various levels of pain is helped or hindered by his experiences. I’ve seen pain scales on the wall at doctors’ offices, but I’ve never been asked to use a pain scale. Does that mean the doctors I’ve seen haven’t experienced much pain? Another difficulty with measuring pain is that people who live with severe pain such as Rheumatoid Arthritis tend to adapt to it. They increase their tolerance to pain out of necessity. This is the reason that people living with RA often complain that pain scales “don’t work because they don’t go high enough.” RA pain is often starts out as the most severe pain a person has ever experienced, so they might rate it with a high number. But, then, if pain worsens or occurs in numerous joints at a time, they wish for a bigger number. Consequently, they adapt their personal pain threshold and now rate the pain which was previously a “9” as a “7” in order to be sure to fit all of their pain onto the scale. RA patients tend to continually increase their pain tolerance in this way. Can we make pain scales make sense? What would be your model pain scale? Please post about it in the comments or on your own blog. Let’s make this our next great blog carnival! 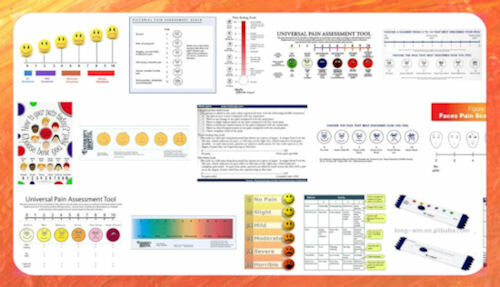 Just send me an email at Kelly @ rawarrior.com with the link to your blog post about pain scales and I’ll post them all here in two weeks (December 28th). Let’s see what our imaginations can create! Please put “CARNIVAL” in the subject of your email. Read the awesome entries of this pain scale blog carnival – click here. Stanford Pain Visual Numeric scale from 1-10. The Comparative Pain Scale has detailed categories, but this is not specific to rheumatology. MIT’s Technology Review published An Objective Way to Measure Pain complete with brain images. The Hypochondria of RA Pain: Do I Smell an Elephant? Click here for more blog carnival posts. I LOVE this article, Kelly! As a physician asssistant who is no longer working because of health issues, including RA, measuring pain was always a difficult task in the various patient care settings where I worked. The most “accurate” type of pain scale that I found useful was one that was the most similar to the second scale above, “The Comparative Pain Scale.” I feel that it is essential for a patient to reflect on his or her pain as it relates to the ability to function in home and work settings, if applicable. The ability to function is KEY and often helps a patient quantify pain more objectively. Time and time again I would have a patient who was obviously very comfortable sitting in the exam room stating that he or she was currently having pain at an 8 or 9 level, yet was able to read or text without difficulty. In order that I could treat these patients without judgment, I had to remind myself that often the pain scale has been explained to patients using the example that “0 is no pain and 10 is the worst pain you’ve ever felt.” It could be that these patients had never experienced what many of us can remember as “Level 10” pain so when they feel their pain is at an 8 or 9, it very may well be to them. My last PA position was at a large psychiatric hospital where I was part of the general medicine team. We provided general medical care for the inpatients which spanned six inpatient units, including children/adolescents, four adult units, and an older adult unit. It was also our responsibility to address and manage pain which was often a challenge. Before I had to resign my position, I was working on addressing just this issue: the issue of “what is the best way to objectively measure pain” and the pain chart I was working on creating was most like the second one above. I really felt that including a measurement of ability to function in daily life would help patients assess their pain most objectively. Of course, there is the issue of how to answer these questions when at an office visit. I’m sure we all have felt the dilemma of “well, what if I don’t feel as good or bad right now as I have over the last few weeks or months?” How should that question most accurately be answered? There is no great way to answer that as a patient, but my pain management physician’s staff always asks what the lowest and highest pain numbers I have had since my last visit. I guess that helps a little bit. 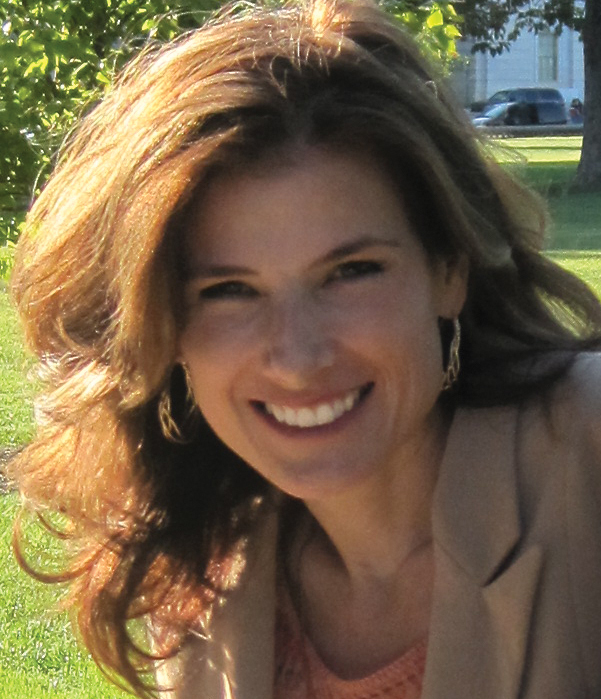 Kudos to you, Kelly, for opening, or reopening, this subject of pain as it relates to RA. Way to go! I obviously don’t have any great insights to add, but wanted to share my thoughts. Thank you for sharing the perspective of the professional, Erika. These are very helpful and specific comments. I’d love to see your pain chart ideas. Hey Kelly! I never even knew until today that you replied. Sorry! I will try to take a picture of the pain chart I was starting to use before I resigned my position and email it to you. 🙂 Have a blessed day! As I read down the comments below, my scale was very similar to the one posted by Cindy. That scale measures ability to function, too, which I feel is key; it takes out the subjectivity of tolerance or “worst pain ever felt” and gives the patient the “benefit of the doubt”. I find those pain scales particularly useless – may I refer you in the interest of laughter to : http://hyperboleandahalf.blogspot.com/2010/02/boyfriend-doesnt-have-ebola-probably.html. A better pain scale (adult language may be used). I understand her pain scale is also available as a poster – perhaps we could provide one to each of our rheumys! Yes, in our research for images last night we noticed that popular old blog post about pain scales (like you said, with adult language). We’re hoping we might do something creative in our community that moved this conversation forward especially as it relates to rheumatology, not to take anything away from something someone already wrote a while back. I hate the pain scale with a passion! If I rate my pain with a lower number- I feel like the doctor/nurse is wondering why I am even there (haven’t had to rate my pain at the Rheumy). If I rate it higher I feel like they are thinking I am faking, looking for pain pills (which is funny because I never ask for pain pills and usually decline them because I hate the way they make me feel), or am just a huge wussy. Plus pain scales are so objective. My worst pain ever (before RA)was gallbladder surgery which to one of my friends with a cronic illness said gallbladder surgery was a walk in the park compare to her lung biosy. Thanks for posting on this, Kelly! I HATE the pain scale. I’ve been wanting to do a blog post on this topic, too, so I’ll put something together for the blog carnival — great idea!! I can’t wait for yours, Dana! You are an artist! What a great post! I can relate to the “pain scale” discussion, especially the part about RA’s and pain tolerance. I live most days now with a level of pain that would have been very high on the scale a few years ago. It’s now my “normal,” and doctors don’t understand. Just because I’ve had to live with it doesn’t mean it’s not important. Now I’m going to go off and work on my chart! Me, too, Fred. I would love to see what you come up with. I can only guess that they have nothing to compare it too. So they have no real idea. That is part of what makes this so hard. It’s not just that we have different “tolerance” like we hear all the time – it’s that we have different actual experiences. I knpw some very lucky people who’ve had very little pain – they are not very sympathetic and they are very grumpy with slight pain. More on this later…I’m leaving myself breadcrumbs to an idea.I think that there are so many factors, different types, tolerances…it does make it difficult. If a doctor asked me to rate my pain I would say which one, the burning, the sharp, the ache, the ripping sensation….I have several going on at different levels. I’m wondering if a flow chart that relates pain somehow as opposed to an absolute number ….going to have to think. Interesting question, Kelly. I finally realized how much pain I am in on a regular basis after I was in a head-on collision (totaled my car, but everyone was ok). People kept telling me how sore I was going to be the next day and were totally surprised when I still showed up for an event I had been looking forward to the day after the accident. However, the pain in my neck, shoulders, arms and back was on the same level or less than RA pain, just more in the muscles and I had impressive bruises where the seatbelt went, instead in my joints. I finally had a description for my pain that was meaningful. I wonder how much acclimation to pain also affects the scales and descriptions. Pain that most would put higher on the scale, I tend rate lower, because it’s just something I’ve unfortunately gotten used to. I LOVED YOUR BLOG! 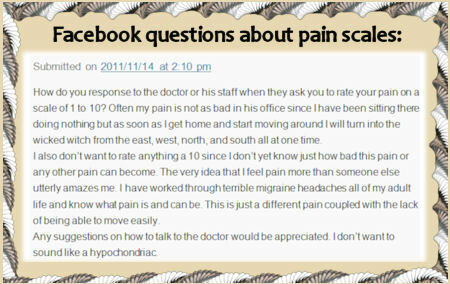 And I too, HATE pain scales. I do like the one in the circle,it’s something most people,even those who haven’t experienced pain, can understand. I had major back surgery last Feb. and everyone told me how long I ‘d be laid up. HA! I was up and walking (with help) the day of surgery. They say pain is relative. I guess so when you have to deal with it ad nauseum (literally!) Unless you’ve been there, it’s really hard to understand pain every day. And again, pain is so subjective. How can one really measure it? If a ten is the worst pain you could possibly imagine, at a 5+ you’d be crying and at 7+ you’d be screaming too much to talk ( if we go with ten being the wort thing imaginable, like lava or velociraptors). What i mean, I think, is that they’re too relative. My 10 might not be your 10. We need a baseline or a reference point. Something like, if the pain you feel from walking into a table (because who hasn’t done that) is a five, rate your pain out of ten. Mild Pain – Nagging, annoying, but doesn’t really interfere with daily living activities. 1 – Pain is very mild, barely noticeable. Most of the time you don’t think about it. 2 – Minor pain. Annoying and may have occasional stronger twinges. 3 – Pain is noticeable and distracting, however, you can get used to it and adapt. Moderate Pain – Interferes significantly with daily living activities. 4 – Moderate pain. If you are deeply involved in an activity, it can be ignored for a period of time, but is still distracting. 5 – Moderately strong pain. It can’t be ignored for more than a few minutes, but with effort you still can manage to work or participate in some social activities. 6 – Moderately strong pain that interferes with normal daily activities. Difficulty concentrating. Severe Pain – Disabling; unable to perform daily living activities. 7 – Severe pain that dominates your senses and significantly limits your ability to perform normal daily activities or maintain social relationships. Interferes with sleep. 8 – Intense pain. Physical activity is severely limited. Conversing requires great effort. Has been compared to natural childbirth. 9 – Excruciating pain. Unable to converse. Crying out and/or moaning uncontrollably. 10 – Unspeakable pain. Bedridden and possibly delirious. Very few people will ever experience this level of pain. This good Cindy because it’s very specific.. I do think that some people who experience severe acute pain frequently (such as unrelenting RA flares without treatment) do “adjust” as it says on number 3, even higher up the scale. I think what patients have been describing is that they slide the scale downward in order to cope. So when they find they frequently have a 5 or 6 for example, they try to redefine it to themselves as a 3 or 4 and learn to ignore more severe pain than they could ignore previously. Thanks for posting about this issue. When I’m in a flare, at a certain point the pain becomes my “normal”. With immense strength of will and medication, I can look fairly normal (ie, not in much pain) for 1/2 hr-1 hr. For example, during my rheum. appt, I may feel like vomiting / sobbing / shivering / etc from the pain, but that would distract from the 10 min. I have with my dr. So I calmly discuss how the pain affects me (can’t hardly get out of bed, hard to do the simplest things like make a sandwich), while projecting a normal outward appearance. I’m sure actions like mine make dr’s wonder if the pain is exaggerated, but what is one supposed to do? What a good way to explain how that works. I wonder if anyone has ever studied how the many patients who are always in “flare” manage to adjust their “normal” on a more pernanent basis. Kelly, I tend to rate my pain by what I am capable of doing. I can sweep my floor today but I can’t scrub the stove because my hands hurt. I can walk to the car but not around the store once I get there. Also, I think something missing from the pain scale is that our pain is chronic. All of the choices listed are ACUTE: a bee sting is over and done, surgery is a few days and done. My pain never goes away — only the position and intensity changes. I love the pain scale at the beginning of your post. It made me laugh out loud. I’ve been a nurse for more than 20 years (although recently going on disability), and thus have dealt with pain scales for years; they became a monitored parameter in nursing, and were expected to be part of a patient assessment. That’s it! We were taught to listen to the patient. Whether or not you see signs like frowning or wincing, you should believe whatever the patient tells you and treat accordingly. I agree completely Meliann with the quote. That is what matters in the end is what the patient experiences. The image was created especially for this post by my daughter and I thank you very much for commenting on it! This blog is so relevant to RA patients. Over time I have noticed that my tolerance for pain has increased dramatically. This is because we learn to live with the constant pain day in and day out. Because of this, I believe I am playing down my current condition of my RA, which is not benefiting me at all in my care. When I first visited the Pain Management Clinic before my first nerve block, they had a pain scale chart posted. When I read through the chart, I was amazed at what they felt the characteristics were for high pain and what I thought was high pain. I have been dramatically under estimating my pain levels, especially when I communicate them to my rheumatologist. What I know now is fighting through the pain is what we do as warriors. That does not lessen it or reduce the impact that it has on our lives. We must accurately communicate our pain levels to our doctors and not speak to lower numbers just because we have learned to tolerate it. As always Kelly nice job! I really like your picture circle at the beginning because the pictures make it easy to relate to. I also like the other pain scales listed, becuase it is easy for me to relate to, having experienced some of the 8 and 9 level pain scenarios. However, childbirth is fleeting, and quickly becomes a memory. Broken bones heal, and again become a memory. Migraines recur, pain due to endometriosis and other conditions such as the relating pelvic adhesions, joint, skeletal and muscular pain from innumerable conditions never ever go away, they just wax and wane, instigated or mitigated by time, the weather, nsaids and pain medication, or even the foods that we consume. 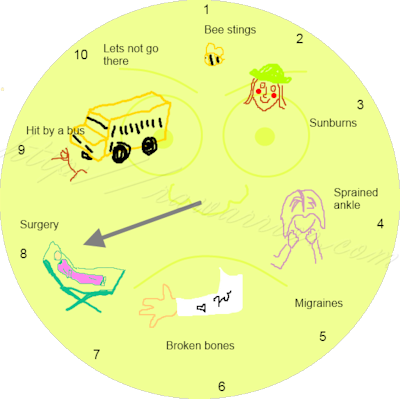 If you have the pain of a bee sting, or 10 or 20 bee stings all day, it is exhausting and eventually does interfere with daily life, bumping that bee sting up to a level 3 or 4, or even a 5, if it is repeated for multiple days on end. That’s when it is hard for the people around you to understand what you are experiencing. Even though you know it could be much, much worse. And sometimes, that is the light at the end of the tunnel. A winner, Kelly. Now that I see your visual representation, I can now describe my pain. I’m thinking of taking it to the rheumy next time. Brilliant! Absolutly brilliant. My rhuemy asked me the other day about my pain. I again still feel very fortunate as my rhuematoid waxes and wanes. But pain is weird, I don’t like the word for Ra patients. Pain to me would be a headache that made you sick. Or having a baby. Now that is pain. But I hurt when flaring and am lucky my flares don’t last for weeks. sometimes by afternoon, I am achey and tired. Achey yes, but horrific pain NO! Right now all my inflamation markers are staying lower, that is good. I still have chronic swelling. I still keep thinking the tests made a mistake on me, until I have one of my flaring days that make me so tired. So how do you describe ACHEY?? thanks Kelly, your a jewel!! 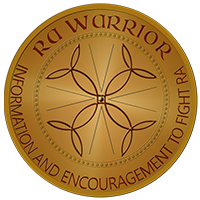 I think the reason most people either can’t or don’t want to understand the type of pain RA can cause is that the pain is constant, unpredicatable, and incapacitating. To most people this sounds like torture, and most people I know are uncomfortable discussing torture and they want to find a way to end it. This includes doctors, and the doctors don’t want to acknowledge it because it makes them feel powerless. So we are left with bad pain scales because no one wants to spend the time researching something that they either cannot comprehend, or don’t want to believe is happening to a person right in front of them. Sorry if this is rambling, bad pain day. Good points, China. It can help us to look for answers if we know what the problem is. I find it difficult to categorize pain levels. I’ve always had a high tolerance for pain, and sometimes don’t notice pain until it impacts my mobility. For example, a day after a nine-hour cancer and reconstructive surgery, I was taken back into surgery for another couple of hours due to a complication. When I was brought back to the room, the nurses forgot to reconnect the automatic morphine pump. Since I never press the button for extra morphine after surgeries, I didn’t notice until I needed to get up for the first time for a trip to the bathroom and couldn’t move. It was only then–because I couldn’t make my body move–that I realized that I was hurting, and the mistake was discovered. This complicated my RA diagnosis last year, I think, because I never told doctors my joints were hurting when I suddenly fell sick. Since my onset began with a sudden spiking of my blood pressure and I didn’t mention the pain, the initial testing was for cardiac and other issues. Now, I know the RA pain is worse when I realize I’m hunched over at my desk and can’t easily rise, that I stumble into walls when I do rise from my desk, that managing the pain is exhausting my body, even if I haven’t “felt” it. That’s when I go to bed. It’s only a few minutes later, when the pain eases a little, that I actually feel the pain and can identify the particular joints that hurt the most, if that makes sense. I actually think now that my onset was not my real onset, and that I’ve been dealing with this for a much longer period. That might be the reason why I tolerate pain without acknowledging it, because I’ve just been feeling some level of pain constantly for a long time. So, a 1-10 pain scale is useless for me. Now that I am done being a smart alec, here’s my thoughts. I’ve never found that straight 1 to 10 very helpful – what is a 2 to me might easily be an 8 to someone else with no context. Cindy’s scale makes a lot of sense to me – it has context. It also made me realize that what I had been reporting as a 2 was in fact a 3 or a 4. We have a number of problems with the reporting of pain. First, it is subjective. Only the patient knows what their pain is and their ability to communicate that is limited. The pain scale that Cindy displayed helps with that communication. Second is experience. Many caregivers have limited experience with pain and their judgement of the patient’s pain is colored by their own experience. Third is that our pain is chronic rather than acute in most cases. Chronic pain can do two things. It can force you to tolerate higher and higher levels of pain as the new normal in your life, under reporting your pain levels to your caregivers and receiving less pain treatment than you should have. Chronic pain, even at low levels, can wear you down; untreated chronic pain is disabling. Again, most caregivers don’t have experience with chronic pain and don’t understand the impact that unremitting constant pain can have. I think you are right on the money when you say we need a better pain scale. Context is the key I think. We also need a better discussion of pain in treating rheumatic disease – this is a primary component of these diseases. I have a LOT of trouble with any rheumatologist that says they don’t treat pain. Hi Leslie. Yourre rigtt that we need a better discussion of pain generally. You make several good points that would be helpful to professional or lay caregivers who are reading. It will never be possible to force anyone to have empathy of course, but we can educate! How can we take your ideas and say David’s for example and others to create a sliding scale? We could use some kind of factor to adjust for pain that is chronic or for people who know that their scale of 10 is greatly enlarged by having tolerated extreme pain in the past. There could be questions we ask that become part of a simple formula to get a more realistic gauge. Also, we need to ask the patient between appointments – just like everything else. It’s not just – what is your pain while you sit here in your slacks, but what was it last week when you couldn’t even move? We forget severe pain intentionally – the mind tries to paper over pain as a defense mechanism. This affects reporting AND empathy. But if we talk about it we can do better. We have learned to be empathetic to so many things – we can learn it about pain. I entered a comment on the MIT Technology Review article. I won’t reproduce it here – copyright problems and all that – but in essence I wondered if their technology would account for long-term chronic pain – and what changes in the fMRI of the brain would occur in the presence of long-term chronic pain. Back in the late 60’s, early 70’s there was some research into pain measurement using a “dolorimeter” – an instrument for measuring pain in labor. The studies all had the same problem – there was less objectivity than they thought there would be. How these studies and the instrument would relate to the grinding, chronic pain of RA is anyone’s guess. I would suggest there is no relationship. I also suggest the “standard” pain scales bear no relationship to our pain and disability! I was recently in the hospital for foot reconstruction surgery(damage caused by RA) and naturally I was constantly being asked about my level of pain. What I found helpful was to tell them that I live at a level 5 or so daily, so they “reset” their calibrations to allow for my normal chronic pain. So, when they neglected to administer the nerve block or install the morphine pump after surgery, and my pain level jumped to a 9, they worked to get it back down to my “comfort level” of 5. I was satisfied with this accommodation for my chronic pain vs. acute post-surgical pain. When it comes to rating what type of pain the RA patient has instead of rating from one to ten. maybe we can describe it in detail; IE..”It feels like someone is constantly cracking my fingers”. The ratings of one to ten mean nothing to me. Id be asking, “…and what part of my body, that hurts right now, am I supposed to be rating, as my hip hurts and my toes, and my hands…. Each one of these body parts all have different pain, and all at the same time. My hips for one would and are at present, excruciating as if I had slipped and fallen on ice. Where as my toes feel like i have been cracking their knuckles, and that small nagging pain will not go away. This is so true! Love the little drawings and totally agree with the pain tollerance. I can not fit and will not fit my pain into a 1-10 scale cause, generally, for me that’s just not where it is at. Thanks for this post. 🙂 It’s great! 1) Composure – Do I look like a calm, peaceful guru (that would be a 1), or like a deer caught in the in headlights (10). 2) Apparent Age – Am I pleased that I look young and alert? (1) or do I look like my grandfather near the end? (10). I think how exhausted I look goes in this category. Old and tired go together. 3) I ask my wife how I’m doing. She can see things I don’t. 4) (This one might not be for everybody.) I try to sing the note A and then play it on a piano or guitar. If I’m perfect that’s a 1, a little flat is 2-3 etc. but sharp means terrible and several notes too high is a 10. These ideas might sound silly but I know when I walk up to the mirror I usually have no idea what I’ll look like. I got up and checked while writing this and didn’t do well on the composure scale (a slight “deer in the headlights” look. Hmm could you see that coming?). I really do believe that these or similar ideas might be made into a useful tool to aid in the assessment of our condition. I’d love to hear of other ideas and see a bunch of us keep logs. We can figure out which ideas work and also get some understanding of how quickly we change e.g. hourly?, daily?. Love this post on your blog….being a nurse from the 80’s I remember when the Joint Commission insisted us nurses document pain by using the 1 to 10 scale…how little I knew then about how it is now that I am on the “other side of the coin” with daily chronic pain how difficult it is for me to give an answer to that question! I have learned to tolerate my pain. If I answer 8 it means I am in big trouble and need help. Thankfully, my pain management doc understands that and mainly notices that I am fidgeting, standing up to massage my back, etc. I am thinking about starting a blog called “Living on the “other side of the coin”….a Nurse’s perspective on living in chronic pain. Thanks Marianne. I’d love to hear more about comparing what you were taught with what you experience. Good idea. Love this….there really is no way to explain the pain. Every joint is different. I had a Rheumatologist (who is no longer in practice) tell me when I put a pain level of 8 on my paper that he had patients with deformed hands worse than mine that didnt have a pain scale that high. He had no clue! Comparing patients to one another is unkind – an unprofessional – in my opinion. At least that’s what I told a dear friend when she told me her rheum did that too. And deformity does not correlate with pain levels – that is an immature and simplistic notion of evaluating pain. Uninitiated people see a deformity and assume it currently is very painful – when it probably hurt more as it was deforming – an invisible and painful process. I hate pain scales….as my pain is pretty “relative” and hard to describe to someone else. 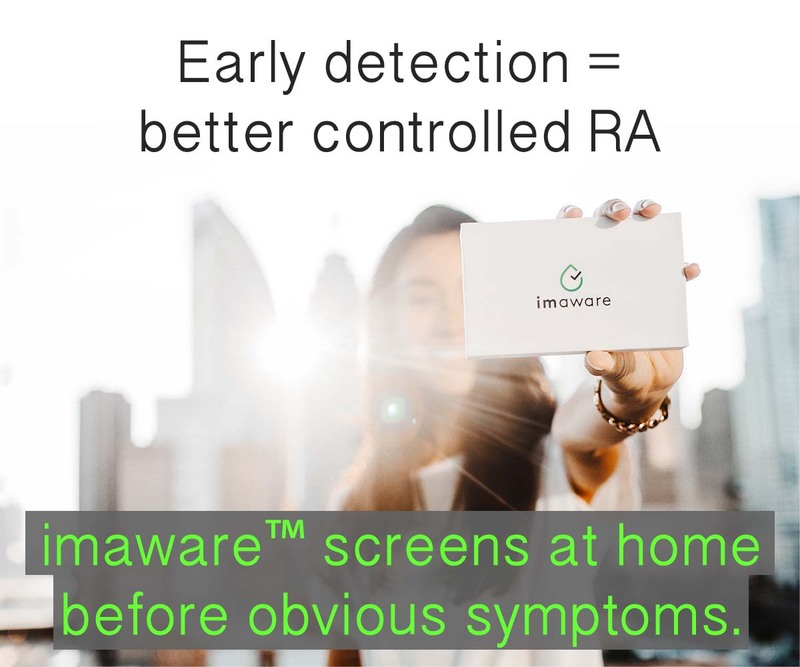 I’m pretty newly diagnosed to RA and was in a flare when the diagnosis was made. In looking back a few years I believe that I’ve had alot of flares, only didn’t know it at the time that was what was happening to me. I’d had “false” diagnosis’ made by a neurologist, a chiropractor and then just ???? from my at-the-time-primary and one other doctor. Then I moved to a new state and it was here that I finally had my answers given. THEN the question of pain on a scale was asked and quite frankly it was hard to say. IF I could or would be able to compare it to “something” (but what??) that may help. Right now I have random ‘aches and pains’—can’t put these on any type of scale. How much would they weigh?? (a pun intended) Sometimes I wish my health-care-providers also had RA so they’d be able to relate alot better to what I’m going through, along with their other patients. Just my humble opinion. Accurately measuring pain let alone communicating it effectively for those that are always is some sort of discomfort and at times in varying degrees of pain is a huge challenge. Same as the frequent question of “how long do you experience stiffness in the morning” so subjective, different daily and hard to accurately make an assessment on. Really looking forward to reading the responses here. Excellent topic. I agree about the subjectivity of pain scales. I have a very high threshold for pain, because before RA my menstrual cycles caused me excruciating pain and I learned to live with it. Although the pain from RA is very different from menstrual pain I realize that I often down play my levels of pain when asked or when completing a pain scale at my rheumy. I think part of the problem is that when people ask you how you are feeling to prevent yourself from sounding like a whiner or complainer we have learned to pretend that everything is rosy. Do people really want to know the truth when they politely ask you how you are doing? I don’t think so, so we learn to deny/ignore acknowledging our pain. The various pain scales used by my rheumy has confused the admin law judge in my SSD case. So we have to wait for him to submit a written clarification before she can make a ruling (other issues that my lawyer didn’t take care of too). Pain is so subjective; can any scale reflect the reality of our every person’s pain level? I was diagnosed with RA in June 2007 and had been in pain mostly in my feet and knees for almost 6 months before diagnosis. The pain started gradually and built up over those months until it wasn’t just pain anymore which I seemed to have been finding ways to live with, but I was feeling horrible, feverish, exhausted and “floaty” by then which WAS affecting my life. Anyway – the actual first time I was ever asked about pain on a pain scale was about 2 weeks after I started on the RA meds. After 2 weeks on prednisone, I was feeling just great! I remember driving to work that morning thinking, wow – this is the best I’ve felt in a long time. A half hour later, I felt a really sharp pain in my ovary area – by the end of the day, I was writhing in pain and blacking out in the Emergency Room – which turned out to be sepsis from a burst ovarian cyst – but no one knew that yet. Anyway – I remember laying there in the worst pain I have ever felt, begging for pain medication and the nurse asked me where I was on the pain scale. Despite my pain and the fog I was in, I hesitated for a minute because I didn’t know how to answer that. I was thinking, well, this is the worst pain I’ve ever felt, but I knew there was pain that could be worse and do they want me to base my current pain on the worst I’ve personally felt or the worst I think it could be? Isn’t that stupid? I laugh at it now because here I am in really bad shape and I stopped to analyze what I should say for the answer to the pain scale. I think I ended up saying 7 or 8 and before I blacked out again, I remember my husband looking at me in frustration and saying 7 or 8??? You’re obviously a 10! I still don’t really know how to give an appropriate answer on a pain scale. I guess i am lucky when it comes to the pain scale. The only time my rheumy or GP use it is when I am doing an equally useless survey. They ask me how my pain is and they can equate that with my blood pressure. When I am in severe pain, my blood pressure goes up. They know what my normal bp is with my normal pain level to compare them. Because I have had the pain for so long it has become my norm. When i had my foot fused at the arch, I didnt need pain peds because compared to what i had been living with, i was then painless, even when i fell because i tried to walk without help the first day i came home after the surgery. My ortho surgeon & GP were amazed. I think that how people experience pain, as well as a comparison to major, relatively common (within a lifetime) pain events, may be useful, more so for the medical professionals who struggle to understand what we mean. So okay, use the scale based on your most painful event so far, define what that is (sprain, severe sinus, childbirth, RA, whatever) then use a series of questions to calibrate it – do you think it is more or less severe than; broken bone, migraine, childbirth, major surgery, etc. This allows us to use (and be encouraged to use) a completely subjective scale for ourselves (so every visit might be 10) whilst we can acknowledge that this may not be the way others would perceive the pain. It also sneakily provides the medical professionals with a comparator they may understand – either personally or via a member of family. I forgot to say – I recently told my GP my pain levels are 4. What I meant was that they are about the same as when I broke my leg (except at that level in in most joints), but not as bad as when I had a ceasar and they kept forgetting to give me pain medication after about 12 hours (7 to 8 on the scale, could not speak), and definitely not as bad as I can imagine. For me, these are all recent peaking type pains ( newbie), so I don’t even know how you could address the additional pain tolerance. This is an excellent idea Jen and I’d like to see it worked out into a chart. I LOVE this! I never know what to say when asked, but I’m printing this & taking it to the doctor each time I go! Pain scale charts are way to subjective in the way different nurses/doctors interpret them. When I had back surgery, the nurse said that she asked mothers if the pain was as bad as childbirth to rate the worst pain. If only she and other professionals really knew how to help patients rate pain levels. Labor pains come and go. Really bad flares come and take up residence in your body, and sometimes patients never have any relief without powerful pain relievers. good point that it’s harder when it never stops – or always comes back – or is in numerous places at once. and some (my mom) say labor didn’t hurt very much. not sure if it’s genetic or memory, but it is really hard to make comparisons. I am new to posting…in fact I have just begun reading articles on RA..mainly because I am afraid. I have to tell you that going over the illustrated pain scale, I began to laugh. When I saw run over by a bus I was laughing so hard I cried. Ok, I know this sounds strange. I was diagnosed 6 years ago with RA. I am currently on Plaquenil, Methotrexate injections (just switched a month ago from tablets), folic acid, Prednisone, calcium, and thyroid meds. August, 2011, I was in remission. My daughter and some of her friends were visiting my husband and me in New Orleans. We had been out and about all day and my daughter and her friends wanted to go to Jackson Square and I chose to sit and have coffee and read at a favorite coffee shop and wait on them. When they finished their tour, they called for me to come pick them up. I grabbed my coffee and was walking across the street to get my car, when I reached the middle of the street (all clear, no cars) an 18 year old girl (on her cellphone) took off from a stop sign (not looking) and ran over me with an F250 pick up truck!!! Luckily the “only” serious injury I had was a broken femur. I was taken to Tulane Hospital and was operated on the next morning. Had a rod from my hip to my knee. I will tell you after having 3 children, this accident was the worst pain I have ever felt! I was hopitalized for a week and then transferred to Tulane’s rehab center for phyiscal therapy for two weeks. Needless to say I went through a lot of pain when I returned home. Began outpatient physical therapy until the RA returned in the fall. I was told by my RA doctor that usually the RA flares immediately with such a trauma, but of course, in my case, it waiting a few months. The point of all this is, I really liked your pain scale because I can truly relate to being hit by a bus!!!! I use mostly a functional scale for pain because it makes more sense to me. Here’s kinda an example of how I rate my pain (1-10). 1. Barely noticeable… Not even sure it’s there. 2. Noticable but easily ignored. 4. Can’t really ignore it, but it’s not effecting my ability to function. 5. Can’t ignore it, it is effecting my ability to function but I can tolerate it. I’m probably grabbing for something to provide some relief. 6. I’m starting to wonder why the hell it hurts like this. It is effecting my ability to function… I don’t want to do anything. I want relief and will happily down a double dose of naproxen. 7. Having a strong impact on my ability to function. I might be swearing. I’m desperate for relief and tasks are done o only out of sure stubbornness (cus someone’s gotta do them). I want to lay in bed… I can no longer tolerate this pain. 8. I am probably crying it hurts so bad. I am desperate for relief and would sell you my kidney if you’d make this stop. I’m making absurd vocalizations and sound like a dying moose. 9. Take me to the ER… PLEASE dear God make it stop. I am writhing I’m pain. Thinking is difficult. I am likely hyperventilating. 10. I think I might be dying. I need to go to the ER now. I cannot do anything but think about how much it hurts. Pain is all consuming and I cannot move other than to writhe in pain. I cannot recall basic facts (like my phone number or how to spell my name). There is a small possibility that I might scream… and I am crying like an exhausted, hungry, overstimulated newborn.